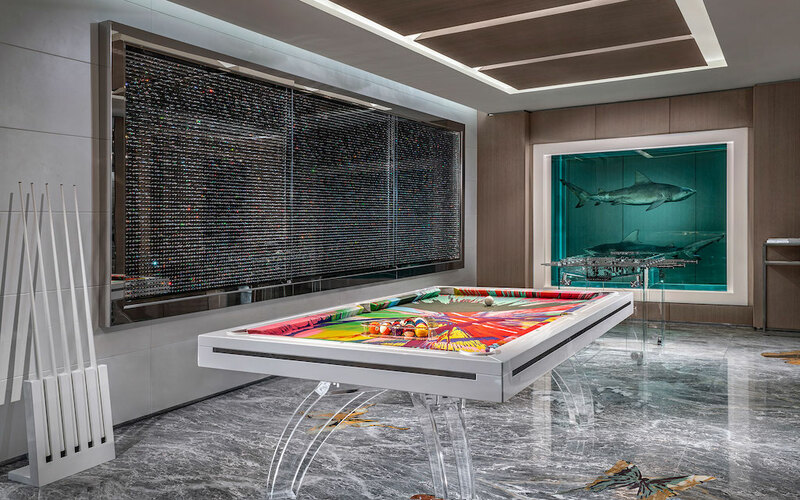 British artist Damien Hirst rose to prominence in the ‘90s with artworks featuring all manner of wildlife — sharks, cows, flayed sheep — floating in formaldehyde. 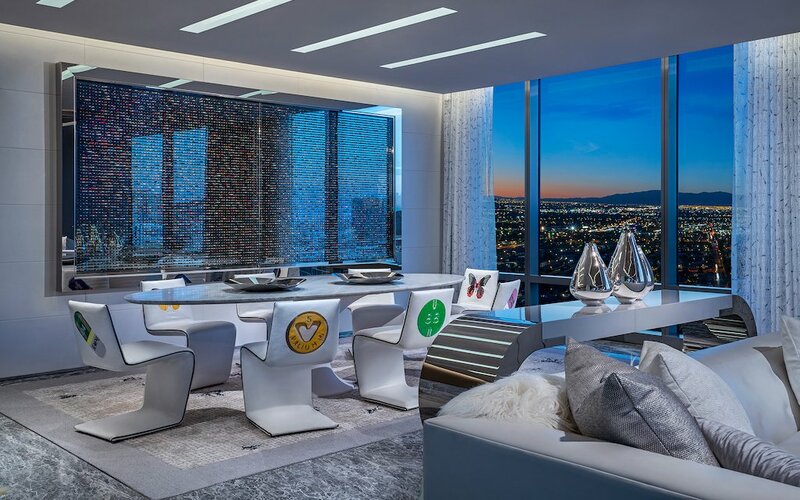 Today, he is one of the most successful living artists, with a catalog that includes equally provocative (and polarizing) work from diamond-encrusted skulls to pill cabinets. 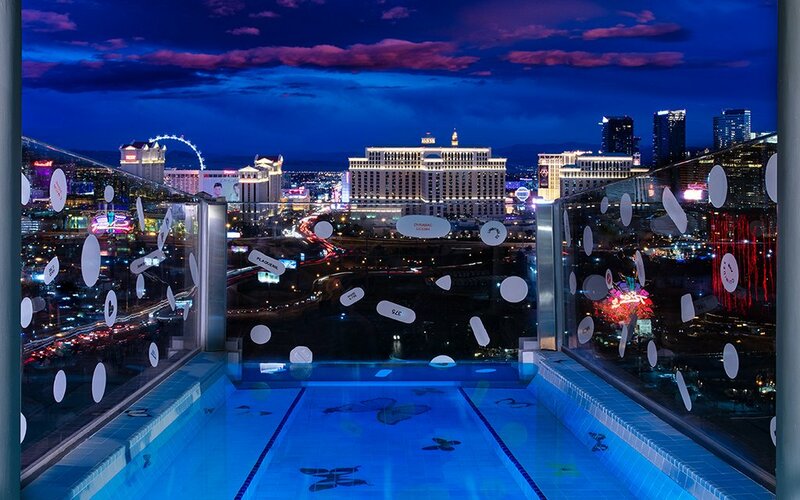 With subject matter like that, and work that will be remembered more for its price than its cultural merit, there’s one place Hirst was bound to end up: Las Vegas. 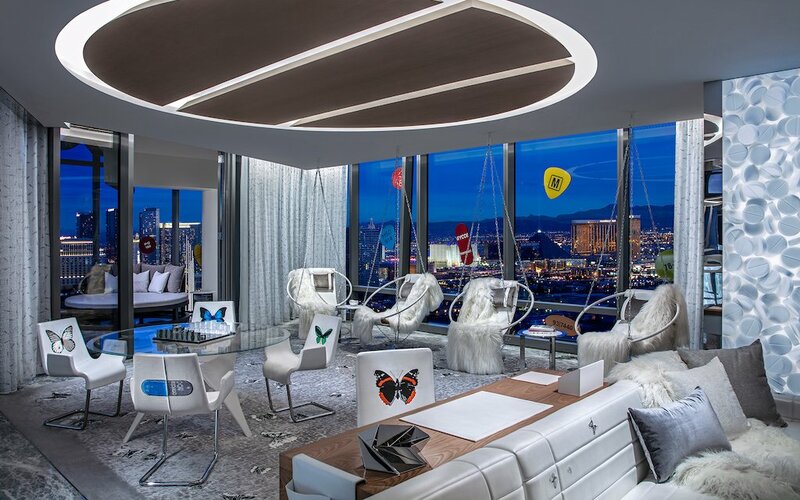 Today, the Palms Casino Resort opened bookings for the Empathy Suite, a two-floor, 9,000-square-foot “Sky Villa” designed by Hirst — part of the property’s $690 million renovation. 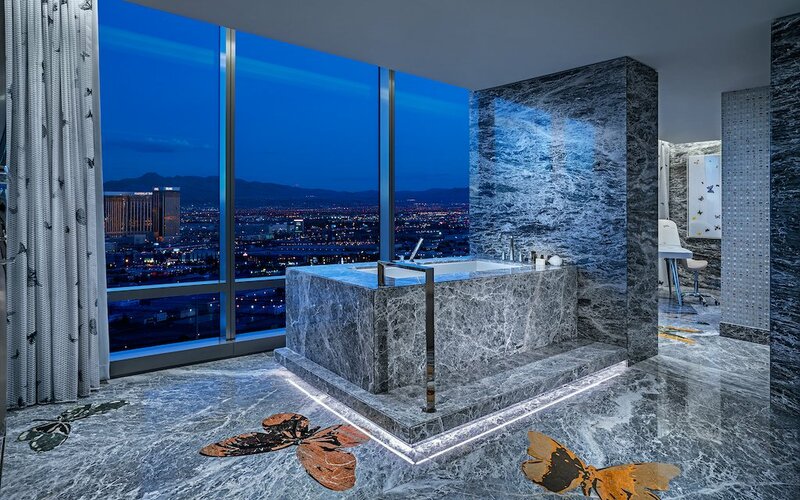 It’ll set you back $200K for two nights (or a simple million-dollar high-roller casino credit line), which makes it the new “world’s most expensive hotel room,” according to Vogue. 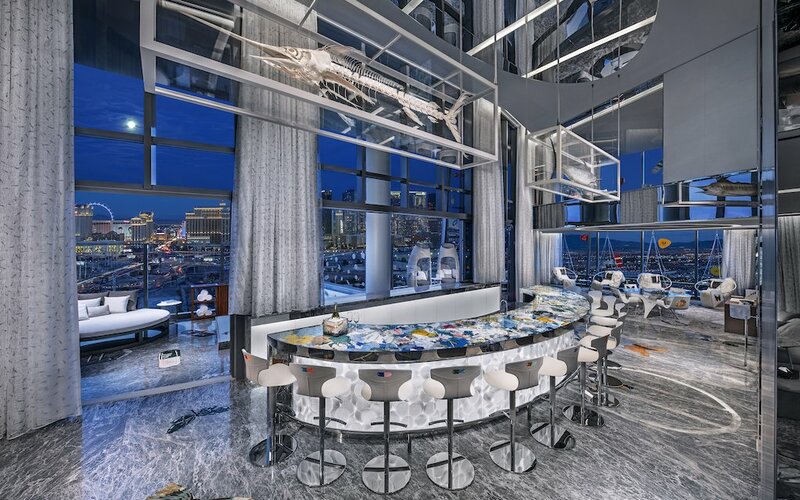 The Palms cites the suite as “the first and only of its kind featuring a collection of contemporary art at this scale.” The collection includes two bull sharks in formaldehyde, a skeleton marlin and a taxidermy marlin, aforementioned pill cabinets, as well as a 13-seat bar filled with, um, used medical objects. Go ahead and ask your 24-hour butler service for a round of Penicillins, and keep ‘em coming. 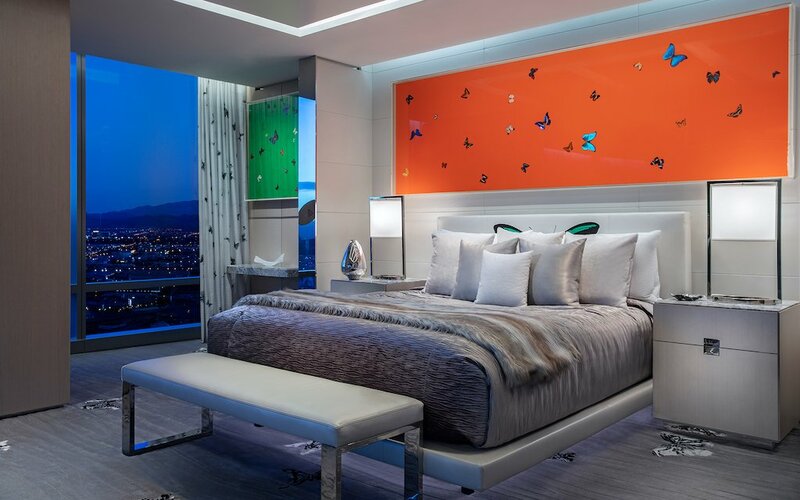 Other amenities include a private cantilevered swimming pool overlooking the city, a fitness room with a Peloton bike (nice), a “healing salt room,” two massage rooms and A-list access to the resort’s other spaces, including the KAOS Dayclub and Nightclub, the first of which will soon host Hirst’s 65-foot Demon With Bowl sculpture in one of its two pools. 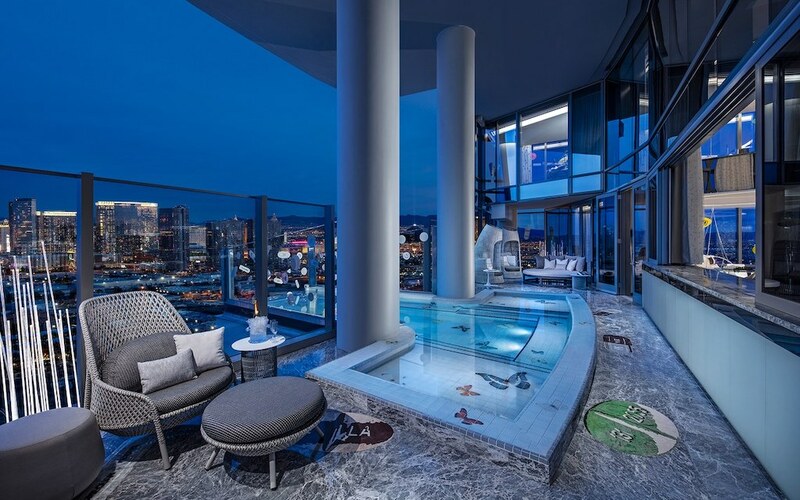 That said, in the spirit of empathy, if you don’t want to blow a couple hundred thousand alone, we’ll gladly fly down and take the second bedroom anytime.